This is a celebration of cuts of meat, innards, and extremities that are more often forgotten or discarded in today’s kitchen; it would seem disingenuous to the animal not to make the most of the whole beast: there is a set of delights, textural and flavorsome, which lie beyond the filet. It began as a play on words and continued as a tribute to one of the world’s most influential chefs and one of my favorite restaurant meals. 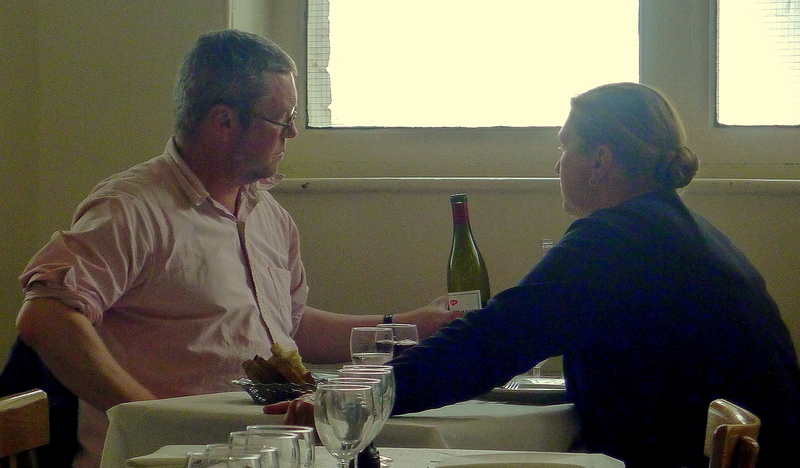 The chef is Fergus Henderson of London’s St. John. The dish is his signature: Roast Bone Marrow and Parsley Salad. “Nose-to-tail” has become a cliché, much like it’s successor, “farm-to-table.” Before either of those became marketing slogans they were the labels for important, and to some extent, transformative movements in the food world. And before “nose-to-tail” was even that it was the title of the original UK edition of Fergus Henderson’s cookbook/manifesto (Tony Bourdain shepherded a US re-issue under the name The Whole Beast: Nose to Tail Eating). And before even that it was what he was doing, what he did and what he pioneered, having brought it back to life after decades English cuisine spent subject to World War II “era” rations that destroyed nearly all but the memory of traditional British cuisine. …it seems common sense and even polite to the animal to use all of it. Rather than being testosterone-fuelled blood-lust, it actually seems to be a gentle approach to meat eating. 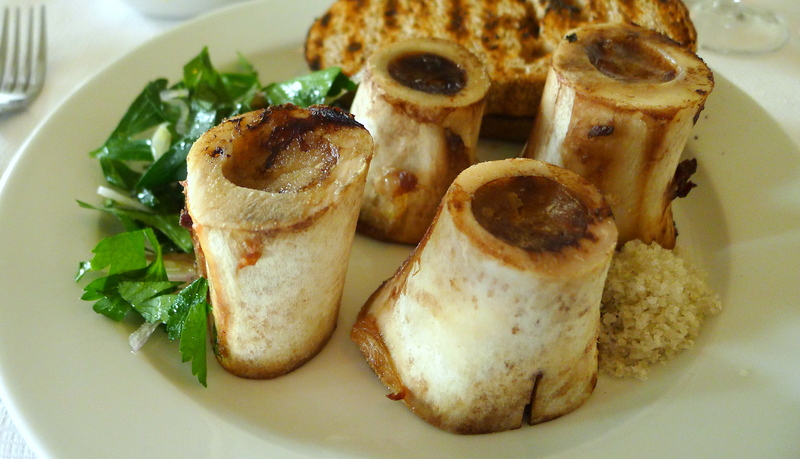 It is a philosophy that is fully on display in Roast Bone Marrow and Parsley Salad. No effort is made to disguise the reality of that upon which the diner is about to dine. On the contrary, it is there: front and center. It is to be—indeed must be—contemplated. And the catalyst for contemplation is the fact the dish is not bite-ready upon arrival at the table. The diner must bring it together at the table, scooping marrow from bone, combining it and the parsley salad on toast and completing the seasoning with a few sprinkles of the finishing salt. But the dish is, first and foremost, this: delicious. It is, of course, marrow that is the key to Henderson’s signature dish. It is marrow, again, that is at the heart of this dish. But it is two different “marrows:” bones, yes, but also marrow beans. The later are white beans that look a lot like Peruana, Great Northern or plumper cannellini beans. They have a creamy texture and a meaty flavor that are precisely why they are called “marrow” beans and exactly why they marry so well with the bone marrow in this dish. To cut the richness of the marrow I use a variation on gremolata, the classic Italian herb condiment—lemon zest, garlic and parsley—that is the traditional accompaniment to ossobuco alla milanese. Just as that dish uses the acidity, pungency and astringency of classic gremolata to offset the richness of bone marrow in ossobucco, I’m doing the same here. But by substituting lime for lemon zest and cilantro for parsley—and by adding a little heat with the red jalapeños—I’m taking the Italian and giving it a hint of a Mexican accent. The pink pickled onions serve to further complement the richness of the dish and also provide a splash of color. And just as Henderson’s original is completed at the table by the diner assembling the dish on pieces of toast, this dish does the same asking the diner to bring all the elements together in a warm corn tortilla. Not only does that process demand the diner’s contemplation and involvement, the inherent earthiness of corn tortillas deepens the sense of soul nourishment. It is a sort of nourishment about which I’ve written in this space before, and one that highlights the importance of offal and of the connection of Henderson’s message with Judaism. And one more thing: it tastes good. Make the Marrow Beans. Combine the soaked beans, vegetable stock and bay leaf in a pot and bring to a boil. Reduce the heat to low and simmer until they are tender. Check after one hour. If they are not tender enough, keep cooking. Because you will be puréeing the beans with the marrow it is not absolutely necessary to keep the skins from breaking. Pickle the Onions. Place the onion slices in a metal bowl and cover with boiling water for one minute before draining. Place the remaining ingredients in a saucepan and bring to a boil. Add the sliced onions to the saucepan and let stand for one to two hours. Store in a refrigerator. Roast the Marrow Bones. Preheat your oven to 450° Fahrenheit. 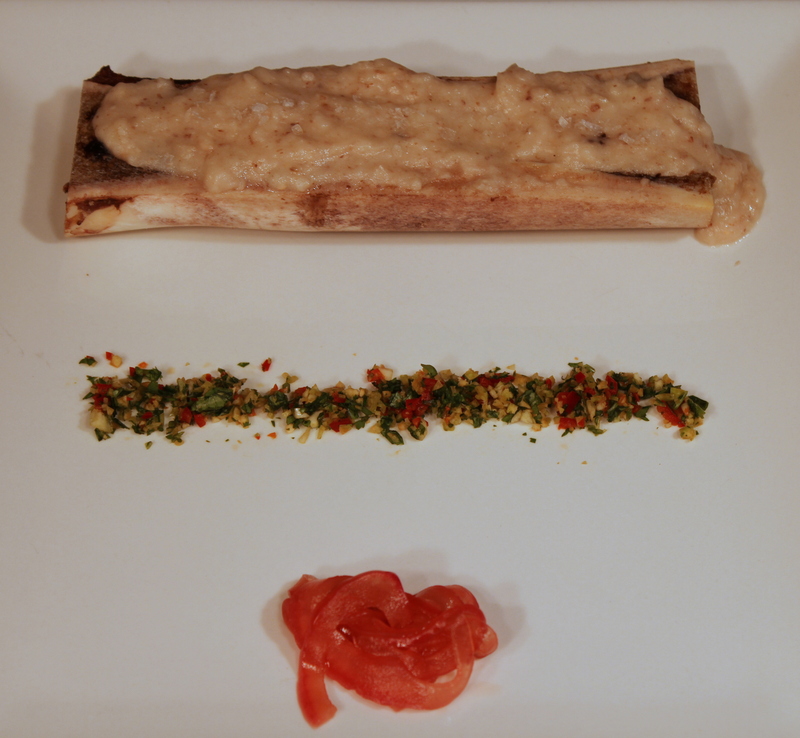 Arrange your (defrosted) marrow bones on a baking sheet covered with aluminum foil (for ease of clean-up). Sprinkle the marrow in the bones liberally with Kosher salt. Roast the bones until the marrow just begins to pull away from the bones, about 20 minutes. Again, because you will be puréeing the marrow with the beans, the timing is not absolutely critical. If the marrow melts you can pour the melted gold into the food processor. Make the Cilantro-Chile Gremolata. Using a zester, remove about 1 teaspoon of lime zest and finely mince. Keep in mind that the zest is the outer peel of a lime, not the inner white pith (it’s bitter). Combine the minced lime zest with the remaining ingredients in a bowl and season to taste with Kosher salt and black pepper. Purée the Beans and Bones. Remove all of the marrow from the bones and add it to the bowl of a food processor. Pour any melted marrow from the pan into the bowl as well. Wasting such fatty goodness ought to be considered a sin. Add half the cooked beans to the bowl of the food processor and process to combine. Taste the resulting mixture and add more beans if necessary, adjusting the seasoning as well. Plate the Dish. Wash the marrow bones and then fill them with the bean-bone mixture. Place a filled bone at the top of the plate. Sprinkle the top of the bean-bone mixture with finishing salt. Using your fingers (a spoon is likely to be too crude a tool) make a line of the gremolata below the marrow bone. Garnish the bottom of the plate with a nice tangle of pink pickled onions. Serve with warm corn tortillas.